The United States has long been the top destination country for migrants worldwide, though if the European Union, Norway and Switzerland were a single country it would outrank the U.S. as a destination for international migrants. But the U.S. and Europe are quite different when it comes to their migrant populations’ origin countries. The U.S. has long been a receiving country for international migrants, and Europe historically was a sending region. For most of the 20th century, either Germany or Italy was the top country of origin of migrants living in the U.S. A century ago, from 1890 to 1919, almost nine-in-ten foreign-born people arriving to the U.S. (88%) were coming from Europe, compared with just 12% of migrants who arrived since 1965. About 46.6 million immigrants now live in the U.S., making up a near-historic 14% of the U.S. population, according to UN data – but as of 2015, only about one-in-ten immigrants living in the U.S. (9%) were born in the EU, Norway and Switzerland. The 28-nation European Union, Norway and Switzerland were home to 57.3 million migrants in 2015, or 11% of these countries’ combined population of 518.7 million. (Though they are not part of the EU, we include Norway and Switzerland in this analysis because they are signatories to the Schengen agreement, which removed internal borders for most of the EU’s member countries.) This figure includes people who moved from one country to another within the EU, such as immigrants who relocated from Poland to Germany. Nonetheless, a majority of migrants in Europe come from a country outside of the EU, Norway or Switzerland – some 61%, or 35 million people. Still, about four-in-ten migrants in Europe in 2015 (39%) can be considered internal migrants, moving between countries that make up this political region of the world. But while the U.S and EU have large migrant populations from many parts of the world, the origins of U.S. migrants are less diverse. About a quarter (26%) of all immigrants in the U.S. come from just one country – Mexico. 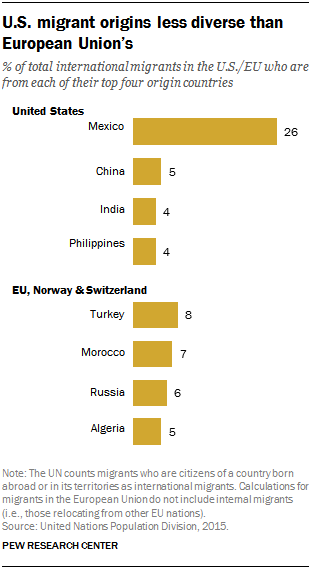 By contrast, Turkey was the top origin country for EU migrants (excluding internal migrants) in 2015 – but its 8% share does not nearly rival Mexico’s in the U.S.
After Mexico, the shares of U.S. immigrants from other top source nations are considerably lower: some 5% from China, 4% from India and 4% from the Philippines. For the EU, Norway and Switzerland, Morocco is the second-largest sending country (7%), followed by Russia (6%) and Algeria (5%). If migrants from other EU nations are included in the total, the two largest source countries are Poland (6%) and Romania (5%). The U.S. and Europe do share similarities when it comes to their migrant populations, however. In both cases, migrants largely live in some of the most populous states (in the U.S.) or countries (in Europe). For the EU, Norway or Switzerland, about half (49%) of all migrants live in the three largest immigrant destinations – Germany, the United Kingdom and France – which are also the most populous overall. For the U.S., almost half (46%) of all immigrants live in the states with the three largest immigrant populations: California, Texas and New York. California by far is the U.S. state with the largest number of immigrants (25% of all U.S. immigrants) and New York and Texas tie for second (11% each).